Hatchery manager Mickey Novak held up a female salmon at the Sunderland hatchery where the fish are mated. SUNDERLAND — The dream seemed tantalizingly within reach: restoring majestic Atlantic salmon to the Connecticut River, where dams had blocked the waterway so completely the overfished population became extinct. Now, almost 50 years and more than $25 million later, the federal government is giving up on restocking the river. The coveted sport fish follow an intricate, circuitous life journey along the 407-mile long Connecticut. Born in tributaries, they swim to the ocean off Greenland before returning to that same tributary to spawn the next generation. Many of their most daunting foes — dams — are now equipped with fish ladders and lifts, allowing the easiest passage in centuries for the salmon. But the fish confront a new nemesis: the changing ocean. So few Connecticut salmon today are surviving their arduous sea journey — a tenfold decline since the early 1990s — federal officials say they can no longer justify spending money to save them. This year, only 54 fish ­returned to the Connecticut River. No one knows exactly why, although theories abound, including the consequences of climate change. “We really thought this was going to work . 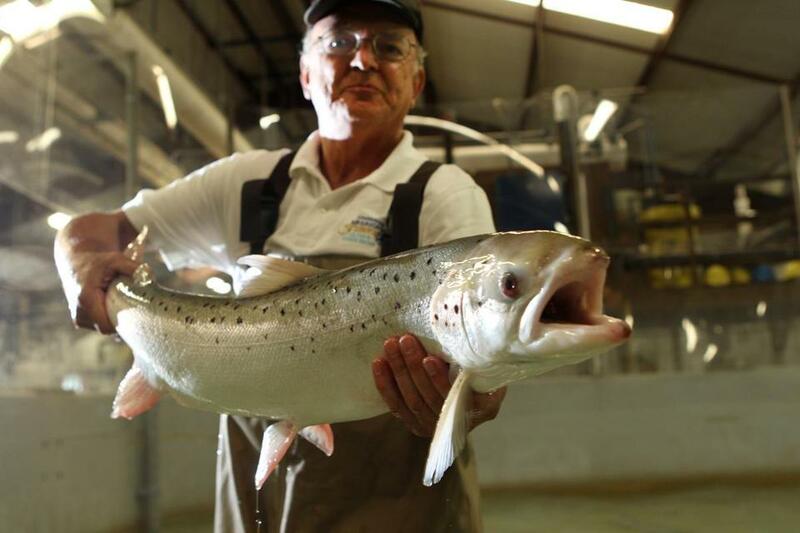 . . but the quality of the ocean is changing,’’ Mickey Novak, longtime hatchery manager at the Richard Cronin National Salmon Station in Sunderland, said as he stood in a concrete holding pool with one of the silver fish writhing in his hands. A decision has not been made about whether the station will remain open. The Connecticut’s story is a painful lesson about the challenge of repairing nature — and an ominous indicator for Atlantic salmon in more northern locales. Maine salmon populations are nowhere near levels that would allow them to be self-sustaining without stocking despite decades of effort, and scientists worry that the fish — or the funding — may disappear before they figure out how to save them. “If Connecticut River fish can’t make it, is it just a matter of time before the northern fish can’t?” Novak asked. New England rivers from northern Maine to Connecticut once teemed with the fish, which became such a regional icon that one was ceremoniously delivered to the US president each year. Pursuit of the wily fish became a quintessential New England sport: salmon clubs proliferated in Maine, and tales of their power at the end of fishing lines were part of family lore. Today, most people know of Atlantic salmon from restaurant menus, but those fish spend their lives in pens, not battling nature to survive. The waters that served as highways for hundreds of thousands of salmon to travel to interior New England were made impassable by dams — 2,500 dams in the Connecticut River watershed alone. By the early 1800s, the fish were extinct from the Connecticut. Wild populations continued to exist in Maine, but their numbers plummeted there, too, because of dams, pollution, overfishing, acid rain, the ocean journey, and other unknowns. Most Maine wild salmon are now listed under the Endangered Species Act. A 1965 federal law was designed to conserve wild anadromous fish — those that migrate from the sea to rivers to spawn. A network of federal and state fish hatcheries, labs, and research facilities was established to save the salmon and a host of other species, including shad, blueback herring, alewife, and sturgeon. Atlantic salmon was always the prize, and along the hardscrabble Connecticut River, its comeback meant even more. Returning adult salmon are taken by truck to the Cronin station,where workers mate them using DNA technology and incubate the eggs, producing 4 million or more young salmon that can be released into the river watershed each year. Despite those efforts, fish began disappearing again. Before 1991, federal and state officials were seeing about 10 fish return to the river for every 10,000 fish that swam out to sea. Now, it is much less than 1 per 10,000. Scientists said they remain deeply perplexed about what is happening in the ocean but know it is affecting Atlantic salmon the world over. The possibilities are many: warming temperatures or acidification from climate change, ­freshwater flowing into the sea from melting polar caps, or changes in food supply or predators. National Oceanic and Atmospheric Administration officials are also examining coastal estuaries to see where fish are being lost and why. Last year, after Tropical Storm Irene destroyed the White River National Fish Hatchery in Bethel, Vt., where some of the fish are raised, discussions turned serious about the salmon effort in the Connecticut. On July 10, the decision was made: The federal government would stop raising eggs and take the estimated $1 million to $2 million spent on the program each year and reallocate it to other seagoing fish, such as shad and river herring. “Our goal is to restore the population to a self-sustaining level, not just bring a few fish back,’’ said Bill Archambault, US Fish and Wildlife regional assistant director for fisheries. “Looking at the return rates . . . it was time to refocus our efforts.” The agency is also reevaluating the Merrimack River ­Atlantic salmon restoration effort to see if that should end, too. State agencies in Massachusetts, Connecticut, and Vermont — which also raise fish and release young salmon in the river watershed but on a smaller scale — have not decided if they will end their programs. If they continue, they would likely focus on returning the fish to only one part of the Connecticut system, or have a program just “to keep this ­genome alive, like Noah’s Ark,’’ said Steve Gephard, supervising fisheries biologist for Connecticut. A decision is expected after October. The end of the federal government’s salmon restoration in the Connecticut River has not sparked enormous outcry from the public: The fish had been gone for so long, there weren’t even great-grandparents who remembered them. Some argued money should be freed up for other species. Still, those who work along the Connecticut and with salmon are not admitting defeat. As the river’s polluted past fades and fish ladders and lifts hoist fish over dams, they say the river is primed for salmon. If the ocean problem can be solved, cleaner, more passable rivers await the fish. “You can’t be in salmon recovery and not be an optimist,” said John Kocik, supervisory fisheries biologist for the NOAA fisheries Maine field station who works with salmon. Beth Daley can be reached at bdaley@globe.com. Follow her @Globebethdaley.